Over the course of five decades, Keith Gilyard has made significant contributions to English studies as a writer, teacher, and participant in professional associations. 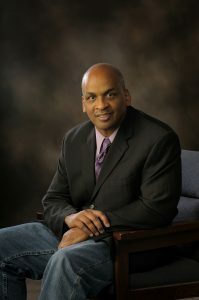 His vast number of publications includes the influential education memoir Voices of the Self: A Study of Language Competence (1991), the wide-ranging True to the Language Game: African American Discourse, Cultural Politics, and Pedagogy (2011), and the revivifying On African-American Rhetoric (2018, with Adam Banks). He received an American Book Award for his biography John Oliver Killens: A Life of Black Literary Activism (2010). He also has published books of poetry, fiction, and criticism. Currently the Edwin Erle Sparks Professor of English and African American Studies at Penn State University, Gilyard previously taught at the City University of New York, where he was named a Faculty Honoree, and at Syracuse University, where he directed the writing program. Active in NCTE since 1983, Gilyard has fulfilled numerous roles in the Council, including membership on the NCTE Editorial Board and the executive committee of CEE. He also served as Chair of CCCC (2000–01) and as President of NCTE (2011–12). Known for his dedication to mentorship, he was the recipient, in 2014, of the NCTE Advancement of People of Color Leadership Award. This award was established in 1950 as the W. Wilbur Hatfield Award and renamed the Distinguished Service Award in 1969. The award recognizes a person or persons who have exhibited valuable professional service to the profession, scholarly or academic distinction, distinctive use of the language, and excellence in teaching. The Distinguished Service Award (DSA) is given to a person (or persons), either volunteer or staff, who have exhibited valuable professional service (within the Council and outside) including scholarly or academic distinction at any level, distinguished use of language, and/or excellence in teaching. These criteria are good measures of acceptable candidates and help to assure that recipients have a wide range of “service” that they provide to the profession. Nominations should be submitted on an individual basis, not by a group or on behalf of constituent groups (conferences, affiliates, assemblies, committees, etc).. The NCTE Distinguished Service Award does not need to be awarded each year. This award should be bestowed only when the committee decides that nominations warrant presentation of the award. This award may be given posthumously. Deadline for 2017 DSA award nominations is June 1, 2017. The DSA Committee will select an award recipient from nominations solicited from the Board of Director (BOD). The Executive Committee will approve the committee’s selection. The BOD will affirm the final selection. 1985 Charlotte Brooks, Washington, D.C.